Every great thing starts with a small step; this is applicable in online education as well. 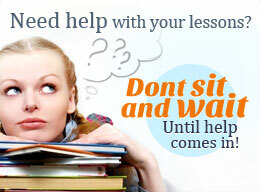 Tutorsville assists every student wanting to take that first step in learning. Our online tutoring service is all-inclusive such that beginners should not expect anything less. You can spend the tutoring minutes you purchase with general basic math help or go for more specific assistance such as algebra help or geometry help. Moreover, get convenient science assistance at the comfort of your home with our chemistry tutor and physics tutor. If you need to polish your basic language skills, you can also hire our competent English tutor.